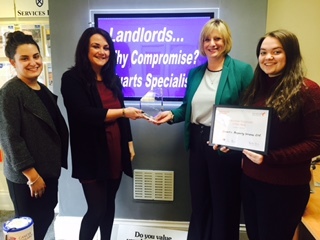 Stuarts Property Services Ltd in Cheadle Village (a Letting and Property Management Specialist established since 1908) have taken on two apprentices through Damar Training. They have been selected and are proud winners of: ‘Newcomer Employer of the Year’ at Damar Training’s 2016 Annual Apprenticeship Awards. Colin and Clare Hayes the directors of Stuarts Property Services Ltd, have worked from 16 years old and both were apprentices in their own fields. They were given a chance in their early stages of working lives and they wish to give back that gift to young people. Clare’s ambition is to hear that one of the apprentices are running their own business one day.